Best Android Emulators for Windows PC and Mac is a need of every windows or MAC user, who don’t have Android device. You can use these Top Android Emulator on Any version of Windows and MAC. Whether you are looking for The Best Android Emulator for Windows 10 or Windows 7 or Any MAC version. The Android Emulators I am going to share in this post will work with all the versions of PC and MAC. When a developer Develop something with his/her imagination, then they need to test the app or software on various platforms to check the compatibility among different Operating systems. For example: If the Android developer develop an application and he needs to test the app on phone then he can test it via his smartphone. But while using PC they need Android emulator to test the Application. Using the Android Emulator Windows or MAC they can check preview how their app will run on Android phone and if they detect any bug or issue in the app then they can fix it instantly. Choosing the perfect Android emulator may seem to be a tough call because you need to check them individually. And then examine which one is good which may take you months to identify. So for all of those people who want to choose top Android emulators for windows PC and MAC. We have taken an initiative for you guys so you don’t need to download 10-20 emulators just to find best one. Below we have shared top and best Android emulators for you which you can use on windows 10, Windows 8, Windows 8.1 & Windows 7 and any MAC Version. All Android emulators Listed below will work on all Windows OS and MAC OS. So let’s get started and explore the top Android Emulators (Free and Paid) available in the market. AMIDuOS is one of the most famous and best Android emulators for PC and also it is the newest Android Emulator. So we have listed the AMIDuos Android emulator on the top of the list. 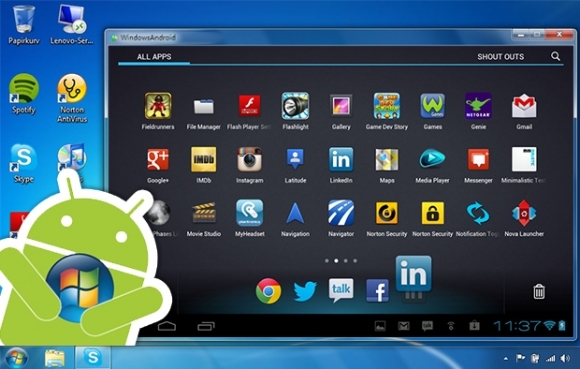 You will find ultimate features to run Android apps on PC using AMIDuoS Emulator. This Emulator comes with two android themes: Lollipop & Jelly Bean. The Lollipop will cost you around $15 bucks and $10 bucks for Jelly Bean. Most of the features of AMIDuos are productivity based and it works very well for multiple purposes. It works phenomenally well for basic works like Playing Android Apps, Games, Doing some office work etc. Let’s have a look on the main features of AMIDuOS Emulator. AMIDuOS offers you the full Android OS experience with all the latest features of Android. It performs very well without any limitations because it is a native android system, that works on the hardware of your PC. AMIDuOS can also play all the ARM applications and it comes with preloaded Amazon App store. It supports 3D acceleration so you can enjoy high-quality gaming experience on your PC. You can share files like pictures, videos, Audios and document between AMIDuOS Android and your Windows PC. It also supports the full Desktop and Table experience like pinch zooming, Full features inbuilt keyboard etc. Bluestacks is probably the most popular Android Emulators in the market and almost all the Android and PC users know about it. The reason for its popularity would also be the age of the emulator because it is the first Android Emulator ever in the Android market. It is completely FREE to download for Windows and Mac computers. You can also run third party apps on Bluestacks, so you can choose best third party apps now and run them on Bluestacks Emulator. The new version of Bluestacks i.e. Bluestack 3 has launched in 2017 is the most recent version of the emulator. It works flawlessly well with all the operating systems and it is packed with the new features and interface. I can say this one Android emulator is the best performing emulators among others. The users can launch multiple instances into the emulators. Which is an amazing feature and allows users to play different apps and games at once. Bluestacks offer the inbuilt app store, where you can see all the latest trending apps and games, you will also see the review and rating the apps there. It also has an inbuilt gift store in which you can find 100’s of gems, golds, characters and many more gifts across many games. Bluestack friends – This feature allows you to interact with other gamers online and you can utilize it to make strategies for game play etc. As I already told you Bluestacks also support multi instance, so you can run multiple apps and games at once. Bluestacks automatically adjust the settings of the game according to your system configuration, so you don’t need to tweak the settings for each game manually. Android Studio is one of the emulators that is approved by Google and it is also counted as the best android emulator for developing Android apps and games. It is specially developed for the developers to develop Android applications and test them on PC. However, You can also run any android apps and games on this emulator using the build in Emulator for games and apps. But the emulator is specially designed for the testing purpose and it would not be good experience using it on the consumer level. Android studio Provides you the ProGuard and App signing capabilities. It provides you the templates based wizards so you can create common Android designs and its components. It allows you to Android-specific refactoring and allows you to apply quick fixes easily. Android studio allows you to drag and drop user interface components and also you can preview the layout on multiple configuration screens. It allows you to preview a color while adding colors as a resource. Remix OS Player is a free Android Emulator for Windows in View of Android 6.0 Marshmallow. It doesn’t support AMD chipsets and only Intel chipsets PC can run this android emulator. It also needs some “Virtualization Technology” changes in your BIOS. The Remix OS Player is the only Emulator which plays Marshmallow Android OS instead of Lollipop or Kit Kat. The emulator is specially designed for games and it has also the pretty good new user interface. Using the Remix OS Player emulator feels like a fresh experience and as you know it is the new emulator so it has some bugs as well, which can be fixed in the newer versions of the emulator. Andy is also known as Andyroid emulator and some calls it andy android emulator. This is a Free Android Emulator that runs almost every app that designed and developed for Android Operating System. It can help all app developers to increase their productivity while making android apps for PC. Andy Emulator is also compatible with MAC and it is a very good emulator. Indeed it has few installation bugs but I hope these will be resolved in the upcoming version. Overall Andy has the capability of becoming the most loving Android emulator and replaced the top Android Emulators like Bluestacks. We will have to see how it performs in the upcoming time and how the developers improve it to make it the best Android Emulator in the Android Market. This Emulator is available for both Windows and MAC operating systems. The Emulator is specially developed to provide the best gaming experience to the gamers but you can also use it for the productivity stuff. Droid4X has very simple and easy to use user interface, which can be used by any Android user. It doesn’t confuse the users when it comes to using the Emulator as it is the easiest and simple interface emulator. ARChon is one of the unique android emulators, you can’t simply download and install it. Although installing the emulator is the tricky part and any normal non-techy user will find it difficult to only installing this emulator. For using the ARChon emulator you will need to install it on the Google Chrome. Then you will be able to install and running the apps into the Chrome. ArChon Emulator is available to download for Windows PC, MAC and Linux as well. If you want you can give it a try and check yourself how the emulator works for you! GenyMotion is technically similar to the Android Studio because it is also geared for the developers. The Genymotion allow developers to test their applications and games on different operating systems and devices without being required to own those devices. You can easily switch between the devices and use the emulator to it’s best for testing your apps on a variety of devices. As I have told you already the GenyMotion has geared up for developers but you can also use the emulator for your personal use. As I have told you already the GenyMotion has geared up for developers but you can also use the emulator for your personal use. Memu is also able to make it into the list of top android emulators because of its one of the biggest feature. And that is it supports both the AMD and Intel chipsets. Memu also allows you to run multiple instances at once and it supports Android Jelly bean Kit Kat and Lollipop. You can run as many apps as you want using this emulator and this emulator is mainly used for productivity stuff by its users. The MEmu emulator is available for free to download. Windroy is one of the old android emulators and it works best on the older versions of windows like windows 7 or windows 8. The emulator is primarily developed for productivity use and you can use office and other similar apps very easily and smoothly on the emulator. The gaming experience is not that good on this emulator, so if you’re a gamer and your main purpose to play the games. Then this emulator is not for you and better you move onto the other emulator for your needs. YouWave is available for windows PC and MAC both, and also it is one of the old emulators. The free version of the emulator allows you to run Ice cream Sandwich Android version, However, you can purchase the Lollipop version for 29.99$. The YouWave emulator is also one of the simple and easy to use emulators. You can use it for playing the games or using productivity apps both. Xamarin is similar to the Android studio emulator as it also provides built in emulator for apps testing purpose. The emulator is especially developer for developers only, although you can also use it for your personal use. The Xamarin Emulator is available to download for free for personal use, but if you want to use it as a company then you would need to purchase a plan for extra features and support. Nox is the absolutely free Android emulator and specially developed for gamers, so if you are a gamer then you might go with this emulator. You can also use this emulator for productivity stuff but most of its users use this emulator to play the games and for entertainment purposes. This is another emulator which specially developed for gaming purpose. You will be able to use the controller using the emulator and also gamers will be able to record the game play and upload it wherever they want. The KoPlayer Android emulator is available for free to use, although it has some bugs but not that much. The emulator is very easy to use and you will find it interesting while using. Yes, you heard it right! You can also make your own Android emulator. Here I am going to tell you how you can make your own emulator. There are many guides available on the internet which you can find very helpful, but if your main purpose is just using the premade emulator then you don’t to be bothered about this solution. We hope now you have the best options to choose from based on your needs. You can download anyone of them according to your requirements. And do let us know in the comment section below about which one you like the most among the Top Android Emulators. If you find this post useful then do share this post on social media.